Wilson Sporting Goods Acquires Louisville Slugger Brand : The Two-Way The $70 million deal will join the makers of Major League Baseball's official bat with the company that produces MLB's official glove. Baseball's most iconic bat has a new owner. Monday, Hillerich & Bradsby Co., which owns Louisville Slugger, announced the brand would be acquired by Wilson Sporting Goods Co. for $70 million in cash. The move means that Wilson, maker of Major League Baseball's official glove, will soon own the maker of MLB's official bat. "With the deal, 52 Hillerich & Bradsby Co. employees will be laid off, mostly from positions such as accounting and information technology, the companies' representatives said. Some other positions will move to operate under Wilson. Currently, H&B has about 270 employees." "H&B will become Wilson's exclusive manufacturing partner for wood bats. H&B will manufacture all Louisville Slugger-branded MLB, Minor League Baseball, amateur player and souvenir wood bats for Wilson. H&B will continue to manufacture wood bats at the Company's downtown Louisville factory. 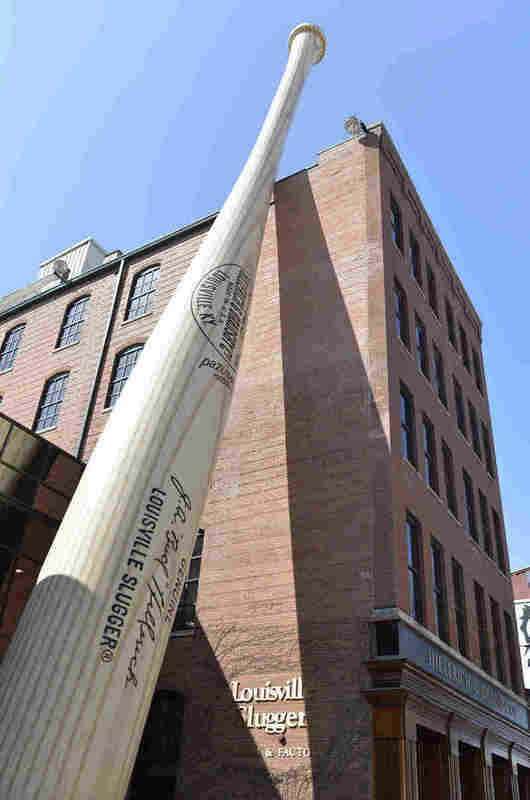 "H&B will also maintain ownership [of] and continue to operate the highly successful Louisville Slugger Museum & Factory and Gift Shop, a cornerstone of the city's tourism business. H&B's Bionic Gloves division and Powerbilt golf brand are not part of the agreement with Wilson." In a that same statement, John A. Hillerich IV, CEO of Hillerich & Bradsby, said, "The decision to sell the Louisville Slugger brand was a difficult and serious one to make. The Hillerich family, and those closest to the brand, firmly believes that a new business model is necessary to realize the enormous potential of this brand in the future." He continued, "We recognized from our first conversation with Wilson that they would be a great partner and steward of the brand our family created and so many have nurtured for 131 years." The Louisville Slugger brand was founded in 1884. The company website says Bud Hillerich made the first Louisville Slugger bat after seeing Pete Browning, star of the Louisville Eclipse, break his bat during a game. According to the brand, Browning got three hits with the new bat the next day. For decades, Louisville Slugger bats were widely popular, used by players such as Babe Ruth, Ty Cobb and Lou Gehrig. Louisville Slugger says its bats are still used by 60 percent of Major League Baseball players. The Wall Street Journal reports the company made $75 million last year. But ESPN reports that the company has suffered recently. Phillip Shirley, coauthor of a book on the history of the Louisville Slugger, told ESPN, "The rise of softball created a new opportunity for competitors, and as everything went from wood to metal from the Little League to the college level, it was an entirely different product that Louisville Slugger wasn't ready for." (Louisville Slugger now makes wood and metal bats.) ESPN also says a number of bat-injury lawsuits against Louisville Slugger "played a small part" in the decision. The sale of Louisville Slugger to Wilson adds to the clout of an already dominant company. Wilson produces supplies for tennis, baseball, football, golf, basketball, softball, badminton and squash. Wilson also makes the official football of the NFL.